hi! 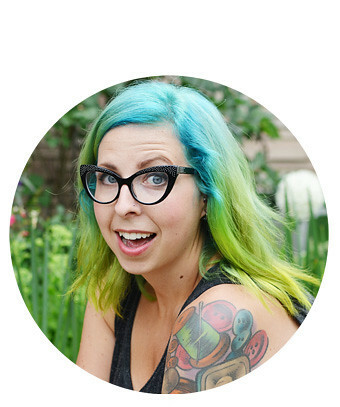 as you can probably tell...i gave my blog a little makeover. i am really excited to share some new features with you! if you are new or just want to know a bit more about me visit the new reader page (click the photo on the top left!) and the about me section! i also have a few links to take you to different types of posts including diys, videos, outfits, wedding plans, recipes, some drawings and what i'm reading. i'm really excited to share the books i am reading this year. i have made a goal to try really hard to read new books. i am normally a major re-reader. if you have any good recommendations let me know! the blogs i love as well as sponsor & contact info and blog buttons is along the nav bar at the top. special thanks to lindsay from LDC designs for that. i used her tutorial to make it! Nice! I recommend you "The Lovely Bones", "Anne of Green Gables", "Little Women", "The Little Prince", "Eat, Pray, Love". What a cute design! I want you to design my blog ;) have a good day! Oh ma gaaaaad Elycia -- it looks so, so, soooo good. It looks really great! I love the new header! So super cute! Mine is in need of a re-do, too! love the new look!! the illustrations are too darn cute! did you do them? tanya, yes i did the illustrations. thank you! wow! you got some talent there miss! love them! Wow - I love it!! Amazing! I LOVE it!! The colours are perfect & go so well together. 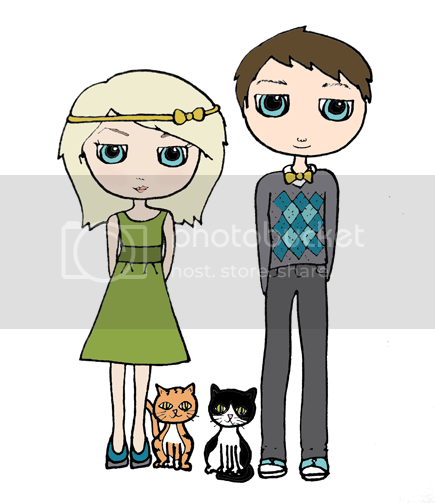 Love the drawing of you & Ivan and the cats! Tooooo cute. Awesome job, Elycia!! I love fantasy books, especially YA (like Graceling and Fire). I recommend Shiver by Maggie Steifvater. It's the best book I have read in a long time. this is my first time on your blog so i don't know what it looked like before, but i LOVE it now!! :) happy weekend!! love the new blog look, it's great! SO PERFECT!!!! Your illustration are really wonderful! my friend started this craft and I thought you'd love it! Its one of the most perfect blogs I have seen, so cute! love the header... did you do it yourself?? Awww!! I adore it, thanks for sharing the tutorial as well!! I adore the new look. Blue and grey is so lovely together... And the tutorial will help me and many other bloggers. Thanks for sharing! I love it! I like the picture you drew for the header--you draw SO well! I am a real reeding nerd and I would really recommend 'Norwegian Wood' by Haruki Murakami , 'Extremely loud and incredibly close' by Jonathan Safran Foer and 'The shadow of the wind' by Carlos Ruiz Zafon. Oh, I love it! Especially the two kitties sitting by you. So cute! :) You are adorable. Sweetness! The new banner is adorable & I really enjoy all the interaction links! Brava!